Home >> Positively Contributors >> My dog can’t keep still – he’s wild all the time! 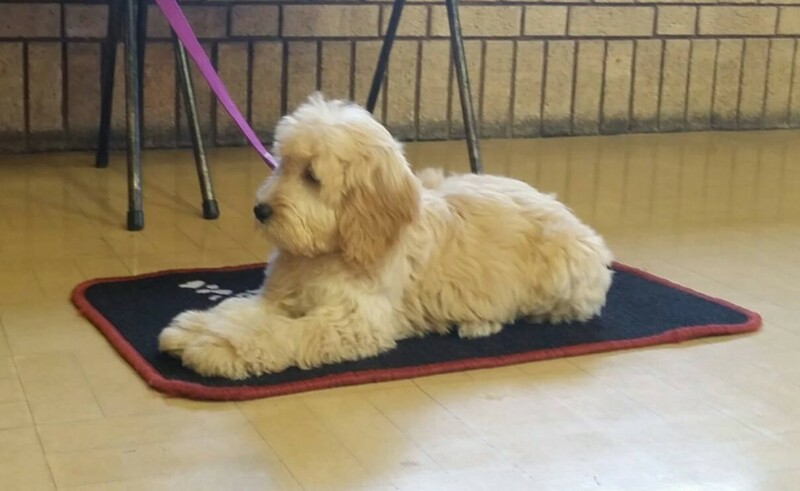 15-week-old Bailey rests quietly on her mat at Puppy Class - an illustration from "Calm Down!" As I asked, “Have you tried teaching him to keep his feet on the floor instead of saying No?” the bouncy lab spotted a new victim for his attentions, leapt to the end of the leash and started giving me the paws-in-the-stomach, nose-nipping, arm-scrabbling, cuff-chewing treatment. I stepped back - but the owner stepped forward and gave her dog more lead so he could continue molesting me! It was as if she wanted to demonstrate thoroughly how awful her dog’s behaviour was. I took the pup gently by the collar and lowered him to standing. He tried to grab my wrist for a while, then gave up. He was panting heavily (it was not hot), his face taut and lined. This dog was not just enthusiastic - he was stressed out of his little brain! Yes, it’s great to have a dog who loves people, but you also want a dog who can control himself to the extent that he’s not getting frustrated, stressed, and frantic all the time. We set to work with a varied training program - all underpinned with impulse control - for the dog. And for the owner: a new way of interacting with her dog, without blame, shouting, and recrimination - all underpinned with impulse control for her! It’s important to note that if you don’t want your dog to do something, rather than try and stop him after the event, you should ensure that the thing you don’t like cannot happen in the first place. This may seem obvious when you think about it. But many dogs are left directionless and expected to fit into the lives of a different species, and know all the rules from the start! We don’t leave sharp knives lying around when there’s a toddler in the house, ready to shout and yell when they pick one up! We put the knives away where the baby can’t reach them. So you need to approach any dog problem from two ends. In the first place you ensure that the undesired behaviour cannot happen, and in the second place you teach an alternative behaviour for him to choose in the future. After a few games which switched Jimmy from lunatic mode to thinking mode, we moved straight into teaching him the wonders of a small mat. Part of this process is to place the rewards between the paws, right on the mat. This is what persuaded Jimmy what a good thing the mat was. When he put his front paws on it, treats miraculously appeared there! I have to add that by now, Jimmy’s owner Jan was standing open-mouthed. She could not believe that Jimmy was choosing to sit still, waiting for permission to move, with no lead to restrain him. She was also amazed that I was not telling Jimmy to do anything - he was working it out all by himself, and once he cracked the code then he could enjoy my praise and laughter and his piece of hot dog. Jan realised that to get a change in Jimmy’s behaviour, she had to change her own. Up to now she’d had little idea what to do. She’d seen tv programs where dogs were shouted or poked into submission, but was quite unable to make that work with Jimmy - probably because she was a nice person herself. She was delighted to find that there’s another way to get what you want from a dog, and no shouting or poking is required! Over the following days and weeks, Jan made sure to spend five minutes a day playing the Mat Game with Jimmy. When I arrived for the next lesson, I was amazed to find Jan opening the door slowly - with barely-suppressed excitement - to reveal Jimmy lying on his mat in the hallway. It was safe to enter the house without my nose being removed or my sleeves shredded! Coco waits on his mat as the door is opened. Illustration from "Calm Down!" Jan’s ferocious determination to stick to her task was unusual. Many people just like to be told what to do - then expect it to happen all by itself. But Jan had a lot at risk. Her daughter was pregnant and she wanted Jimmy to learn how to behave politely and calmly for when her daughter visited with the new baby. So Jan’s results were very quick. She so enjoyed this new way of interacting with Jimmy - without shouting and blaming - that she had discovered what a genuinely nice dog he is. This new-found calmness and responsiveness was pervading all their lives and was a huge change for the better. Some people will take longer to get their dog to the stage Jimmy reached quickly. But what matter? So long as you get there in the end, improving your relationship with your dog all the while, speed is not important. Inside every manic, stressed, dog, there’s a calm, friendly creature just waiting to emerge. I’ve given you enough to get you started here in your dog’s transformation from wild puppy to Brilliant Family Dog. 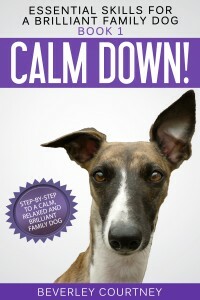 But to get all the low-down and a detailed program to work from, have a look at Book 1 in the new Essential Skills for a Brilliant Family Dog series: Calm Down! Step-by-Step to a Calm, Relaxed, and Brilliant Family Dog. I’ll take you by the hand and guide you through the steps, just as I did with Jan.
And the best news? For a limited time this book is free at most outlets!